Discussion in 'Amps and Cabs' started by Digam11, Jul 10, 2008. Just took delivery on this Vox Cambridge Reverb. Had a couple hours w/ it this afternoon ... sounds nice and clean. Reverb and Tremelo are perfect. Solid State? Those old SS amp sound damn good. I've got the tube version. Plug a lester into it - go to 10 and it's Led Zep 1 and 2 baby! The CR has the orig 2 prong plug and , as far as I can see , everything else is orig as well. Should I change out the 2 to the 3 plug or leave it as it is ? Opinions ? I have the tube Cambridge Reverb. My favorite amp for recording. If you plan to play the amp, then I would convert it to 3 prong. Otherwise, leave it alone. The solid state Cambridge Reverb was my 1st amp also. I had really positive, or at least nostalgic, memories of the tone of that amp. A few years back I finally scored another. It sounds way better than I remember. Like others have said, the trem is just killer - deep, throbbing trem bliss! I can't wait to record with it. It would be kind of useless live as it really doesn't have much umph. 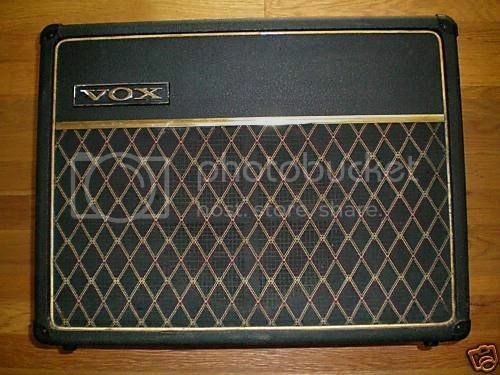 Amps like this might give solid state a good rep.